A biopsy is the removal of cells or a piece of tissue that is then analyzed under a microscope by either a cytologist or a pathologist. This is the only way to confirm that you have a diagnosis of cancer. The importance of the biopsy report could not be more emphasized. Sometimes a doctor or dentist will remove something that looks abnormal and send it to a pathologist, and the pathology report will be missing some important information such as the grade of tumor; how deep it goes; whether it is endophytic, exophytic or ulcerated; and whether there is a rim of normal tissue around the cancer. All these factors need to be evaluated either after a biopsy or after a more definitive removal of the cancer. Ask your doctor about the CAP protocols. There are many ways a biopsy might be done. This will mainly depend on the location of the suspicious lesion. If there is a concern for a cancer inside the mouth, you will need an oral biopsy. There are a number of ways to do this. Fortunately, almost all tumors in the mouth can be biopsied in the office with a little numbing medicine (either a spray, a tiny injection or both). Just keep your mouth open and stay still. It will take only a few seconds to do the biopsy. After a piece of the lesion is removed, pressure will be applied with gauze to stop any small amount of bleeding that will result from the biopsy. The bleeding usually stops after a few minutes, or your doctor might dab it with a chemical to stop the bleeding. In some cases, a doctor might elect to take a patient to the operating room to perform a surgical biopsy. Incisional oral biopsy: This is a biopsy in which the doctor will take a piece of the suspicious lesion without removing it all. It is important to be sure the biopsy is deep enough to make a good diagnosis. Punch biopsy: This is just another way to perform an incisional biopsy. A tool called punch forceps is used to remove a piece of the suspicious area in your mouth. Excisional oral biopsy: In this technique, the whole area of concern is removed. Typically, if the diagnosis is unknown, it is better to do an incisional biopsy to find out what the diagnosis is and then determine how much normal tissue needs to be removed around the lesion. Brush biopsy: This is often used by dentists, and they basically rub a few cells off the surface of a suspicious lesion. This is not ideal for diagnosing oral cancer because it doesn’t get into deeper layers of tissue. However, it can give some information and lead to a diagnosis of cancer. Fine needle aspiration biopsy: The most common and easiest way to biopsy is fine needle aspiration biopsy (FNAB), in which a tiny needle is placed into the tumor and some cells are drawn out through a syringe. The pathology doctor, known as a cytologist or cytopathologist, will then immediately look at the cells under the microscope and let your doctor know if there were enough cells to make a diagnosis. A number of “passes” might be done to increase the likelihood that there are enough cells to make a diagnosis. The final diagnosis may take a few days to come back. There are a variety of techniques your doctor might use to biopsy tissue located in the nose, sinuses or nasopharynx (the area behind your nasal cavity). In general, the biopsy can be done in the office or in the operating room, depending on a variety of factors that the treating physician will discuss with you. Sprays and/or pads are usually placed inside the nose to decongest and numb the area. The doctor may use an injection for this purpose as well. The doctor will likely use one of the techniques described below to remove a piece of the suspicious lesion in the sinonasal area. After the biopsy, more pads or sprays will be placed inside the nose to control any small amount of bleeding that may result. The bleeding will usually stop on its own. Endonasal biopsy: In this technique, the doctor will use a nasal speculum and a good light to look inside the nose and will take a piece of the suspicious tissue using forceps. Direct rigid nasal endoscopy: Here, the doctor will place a steel rod telescope into the nose. Then, either through a video projection or looking directly through the telescope, the doctor will place forceps into the nose, nasopharynx or sinus to take a piece of any suspicious tissue for analysis. Transnasal flexible endoscopy with biopsy: The doctor may spray your nose with some medications and then slowly and carefully place a flexible tube with a camera through the nose, down into the throat. It is important to sit still, breathe slowly and listen to the doctor’s instructions. The camera used in this case has a special attachment through which the doctor can spray medicine directly onto the area of interest to numb it. Through that same attachment, the doctor can pass thin biopsy forceps and clip off a tiny piece of the suspicious growth. The main advantage of transnasal flexible endoscopy with biopsy is that it is usually quick and easy, and it’s not necessary to go to an operating room or undergo general anesthesia. However, the doctor can only get a tiny piece of tissue this way, and it might not lead to the correct diagnosis. Also, it’s not as good a view as a direct examination in the operating room. Finally, the doctor can’t feel around or get as good a look as with a direct laryngoscopy. After the biopsy, more pads or sprays will probably be placed inside the nose to hold pressure to control any small amount of bleeding that will result. The bleeding will stop on its own. Transnasal flexible endoscopy with biopsy: If the doctor sees a suspicious lesion that can be biopsied in the office, this method is a possibility. This is just like having a transnasal flexible laryngoscopy, except the camera used in this case has a special attachment through which the doctor can spray medicine directly onto the area of interest to numb it. Through that same attachment, the doctor can pass thin biopsy forceps and clip off a tiny piece of the suspicious growth. The main advantage of transnasal flexible endoscopy with biopsy is that it is usually quick and easy, and the patient doesn’t need to go to an operating room or undergo general anesthesia. However, the doctor can only get a tiny piece of tissue this way, and it might not lead to the correct diagnosis. Also, it’s not as good a view as a direct examination in the operating room. Finally, the doctor can’t feel around or get as good a look as with a direct laryngoscopy. Direct laryngoscopy or esophagoscopy with biopsy: This technique might be chosen if the doctor can’t get a good biopsy in the office or wants to get a better look all around the patient’s throat in the operating room.For select throat tumors, the doctor might either take a small piece in the operating room to confirm the diagnosis or remove the entire mass (an excisional biopsy). Also, the surgeon will take the opportunity to thoroughly feel all around the patient’s neck, mouth and throat while he or she is asleep. Finally, the surgeon will look for any additional suspicious lesions (called second primaries). Another advantage of this technique is that frozen section pathology is usually available in the operating room to make certain that enough tissue has been sampled to make a definitive diagnosis. For this to be done, the patient will go to sleep with anesthesia in an operating room with a small breathing tube placed through the mouth into the windpipe. Then the surgeon will place an instrument called a laryngoscope through the patient’s mouth and look all over the throat. The surgeon can even use a longer scope, called an esophagoscope, to look at the upper part of the esophagus. The surgeon will then use small forceps to take a piece of tissue from any suspicious-looking area. In some cases, the doctor might remove the entire lesion, possibly using a variety of instruments, including a laser. If needed, your doctor might talk to you in advance about doing a tracheotomy or using a feeding tube during this procedure while you are asleep. CT-guided needle biopsy: This is used quite rarely for throat and esophagus tumors. It is usually required only if the surgeon cannot get to the suspicious area despite trying the standard ways. CT-guided needle biopsies are typically done by a radiologist. Most often this technique is used to evaluate lesions in remote locations, such as suspicious nodules in the chest. The advantages are that this technique can help to avoid a trip to the operating room, and the needle can reach some areas more easily than your surgeon could through the mouth, throat or neck. The doctor can only get a tiny piece of tissue this way, and it might not lead to the correct diagnosis. It does not provide as good a view as a direct examination in the operating room. The doctor can’t palpate (or feel) around for other suspicious lumps and bumps. The doctor can’t examine the entire throat and hypopharynx directly. For a CT-guided needle biopsy to be done, the patient will be placed into a CT scanner, and a few low-dose CT scans will be performed to identify where the tumor is located. A tiny injection of medicine is used to numb the skin. Then a small needle will be passed through the numb area toward the tumor that was located earlier. This may require a few low-dose CT scans as the needle is adjusted to make sure it gets into the area of interest. There is some emerging technology such as fluoroscopic CT scanning by which the radiologist can quickly take a few scans without leaving the room as the needle is moved around to get it into the right place. Transnasal esophagoscopy with biopsy: While not all doctors will do this, it is technically possible to use a long flexible camera (a little longer than the flexible laryngoscope) and look past the pharynx into the esophagus. Actually, with most of these special cameras, it may even be possible to take a tiny biopsy right in the office. Talk to the doctor to see if this is an option. Flexible esophagoscopy with biopsy: With this technique, the patient will receive some sedation but not be put completely under. A specialist will put a flexible camera into the patient’s mouth and look down into the esophagus. The specialist will then be able to look at the entire esophagus and biopsy any areas that look suspicious. Rigid esophagoscopy with biopsy: With this technique, a surgeon will take the patient to the operating room and give the patient general anesthesia with a breathing tube. The surgeon will first thoroughly feel the patient’s neck while he or she is asleep and then look inside the patient’s mouth and throat, including the larynx, to make sure there are no other suspicious areas. The doctor will then move on to the rigid esophagoscopy. For this procedure, a metal tube is carefully placed into the mouth and down into the esophagus. It gives the surgeon an excellent view of where the tumor starts and ends and allows him or her to take biopsies. Biopsies of the skin are more straightforward than for other sites, mainly because they are easier to get to. Typically, the patient will get a tiny injection of numbing medicine before the procedure. The biopsy needs to be interpreted by a pathologist, known as a dermatopathologist, who specializes in skin disease. Incisional biopsy: In this technique, a piece of a suspicious lesion is removed. The goal is NOT to remove it all but to get a good enough piece that a pathology doctor can make a diagnosis. The second step will be removing it all and treating it. One or two sutures (stitches) might be required to close up the skin. Punch biopsy: This is a type of incisional biopsy in which special circular forceps penetrate into the skin and then a quick little cut releases a cylinder of tissue. This is usually done at the edge of normal skin and an abnormal-appearing lesion on the skin. The advantage of this method is that it can determine the depth of an invasive cancer. 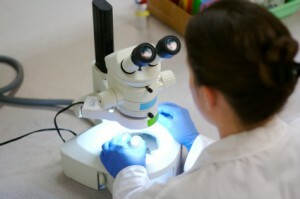 Excisional biopsy: In this technique, the entire lesion is removed and then analyzed under a microscope later to find out what it is. A rim of normal tissue is removed along with the lesion. The problem with this technique is that if additional treatment is required (for example, the need to take even more normal tissue), it can sometimes be difficult for the surgeon to see exactly where the lesion was. A few sutures might be required to close up the skin, and there will be a scar. Shave biopsy: In this procedure, usually performed by a dermatologist who has a low suspicion of cancer, a very thin layer of cells is removed using a sharp blade. Typically, a shave biopsy should not be used if there is suspicion for cancer because it does not give good information about how deep the cancer goes into the skin. Knowing the depth of the cancer can determine the best type of treatment. 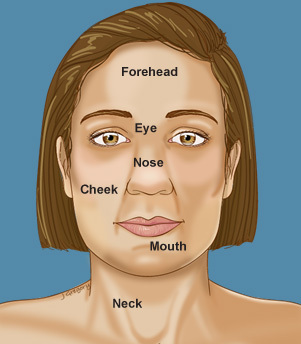 In some cases, the doctor might want to assess lymph nodes in the face or the neck. This can be done by fine needle aspiration, core biopsy, open biopsy (rarely) or by sentinel lymph node biopsy in the operating room. Sentinel lymph node biopsies for skin cancers are used mainly for melanoma and Merkel cell cancers. Open biopsy: In some cases, particularly if the diagnosis can be surmised based on imaging and history, the surgeon might recommend that the patient go to the operating room and be put to sleep. Then the surgeon can expose the orbital tumor and either take a small piece to get a frozen section diagnosis immediately from the pathologist, remove a small piece and send it off to the pathologist for additional detailed analysis or simply remove the entire tumor (the last one is called an excisional biopsy). The exact approach taken to perform the biopsy will depend on the location of the tumor. Fine needle aspiration biopsy: Just as in neck masses and other sites of disease, a very thin needle can be inserted through the skin and into the lesion to extract cells. Numbing medicine is usually not necessary. However, the area should be thoroughly cleaned. Transnasal biopsies: For tumors growing into the nose, or tumors on the inner part of the orbit, the doctor might be able to perform a biopsy through the nose using special cameras. The nose will be decongested and numbed. Then, using a camera and long forceps, the surgeon can take a piece of the tumor. If some of the orbital wall needs to be taken down to get access to the tumor, the surgeon will probably prefer to do the procedure in the operating room with the patient asleep. Fine needle aspiration biopsy: The most common and easiest way to biopsy is fine needle aspiration biopsy (FNAB), in which a tiny needle is placed into the tumor and some cells are drawn out through a syringe. The pathology doctor, known as a cytologist or cytopathologist, will then immediately look at the cells under the microscope and let your doctor know if there were enough cells to make a diagnosis. A number of “passes” might be done to increase the likelihood that there are enough cells to make a diagnosis. The final diagnosis may take a few days to come back, so it is important to be patient. When Your Doctor Might Use This Technique If the lump can be easily felt by the doctor. If the doctor thinks it will be difficult to get the needle directly into the lump with certainty. If the doctor doesn’t think he or she will be able to get into the tumor by feel or with ultrasound guidance. What to Expect The doctor will feel the lump and place a tiny needle directly into it to extract some cells. The doctor will use a gentle probe on the patient’s face or neck, identify the tumor with the ultrasound and then watch the needle go directly into the tumor on the ultrasound machine. The patient will be placed into a CT scanner, and a few low-dose CT scans will be performed—first to localize the tumor and then to make sure the needle that is placed is actually within the tumor.There is new technology known as fluoroscopic CT scanning, in which the radiologist can quickly take a few scans without leaving the room, moving the needle around to get it into the right place. Core biopsy: Core biopsy is an alternative to fine needle aspiration. A core biopsy is done in the same way as an FNA biopsy, but it uses a larger needle and removes a core of tissue from the tumor rather than just a few cells. The likelihood of false positives and false negatives is much lower with a core needle biopsy than with a fine needle biopsy. Open neck biopsy: An open biopsy involves making an incision over the tumor and removing either a piece of or the entire tumor to make a diagnosis. An open biopsy of a neck mass is performed through an incision over the lump, and either a piece (incisional open neck biopsy) or the entire lump (excisional open neck biopsy) is removed to make a diagnosis. Except in a few special circumstances (such as if the tumor is likely a lymphoma or if other methods of diagnosis have not worked), this method should not be used to find the diagnosis of a neck mass. Sentinel lymph node biopsy: A sentinel lymph node biopsy is a type of lymph node biopsy being used for some cancers of the head and neck. This technique is mainly used in skin cancers, such as melanomas and Merkel cell cancers, but some doctors are using them in oral cancers as well. Cancer cells spread from a tumor to regional lymph nodes by traveling through a channel of lymph and making a stop in the first lymph node along the way—the sentinel node. In SNLB, special techniques are used to figure out where that first lymph node is located. Then that lymph node is removed and analyzed. If there is cancer in that lymph node, the rest of the lymph nodes in the region are removed. If there is no cancer in that lymph node, the doctor will closely watch the area but save the patient from undergoing additional treatment that might not be necessary. For oral cancer, the advantages and disadvantages of SLNB are not very clear and are still being studied. To do a sentinel lymph node biopsy, the patient will go to a nuclear medicine specialist a few hours before surgery. This specialist will inject the area around the cancer with a special molecule. Then the specialist can take pictures using a variety of methods. When timed correctly, the images will help the surgeon find where the first draining lymph node is located. Next, the patient will go into surgery. Once the patient is sedated, the surgeon may or may not inject the area around the tumor with a very small amount of blue dye. Sometimes that dye can also drain into the first lymph node. The surgeon will also use a machine called a gamma probe. This probe is passed over the area where the first lymph node is supposed to be and makes a high-pitched screaming noise when it’s near. This, along with the blue dye and the images taken earlier, can act as a road map to get that first lymph node out and analyzed. Then, once the main tumor is removed, the surgeon will make an incision to remove the sentinel lymph node using the “maps.” Once the sentinel lymph node is removed, it is sent off to a pathologist to determine if additional surgery is necessary. If the results aren’t immediately clear, you might have to come back later for more surgery. But the goal is to figure it all out at one surgery. Sometimes there may be more than one sentinel lymph node. There are a few different methods of performing a biopsy, depending on where the suspicious lesion is located. Before undergoing a biopsy, the patient will be asked if he or she has any medical problems or if the patient takes any medications that might increase the risk associated with biopsies (such as bleeding). Sputum cytology: This involves spitting up mucous brought up from the lungs and analyzing the cells within the sputum. This is the easiest method for patients, but it has the lowest chance of achieving a correct diagnosis. Transthoracic image-guided needle biopsy: This biopsy is done with a needle inserted through the skin of the chest. An imaging method, such as CT scan, fluoroscopy or ultrasound, can be used to guide the needle into the area of concern prior to taking a biopsy. This has a high yield, but it does carry a higher risk of trapping air around the lungs (pneumothorax) than biopsies done from the inside. Biopsy: A piece of tissue will be removed from the lesion using forceps and analyzed under a microscope. Transbronchial needle aspiration: A needle will be inserted into the lesion and some cells will be sucked out and analyzed. Brush biopsy: The lesion will be swabbed, and cells from the surface of the lesion will be analyzed. Bronchoalveolar lavage (BAL): Saline will be flushed into the area in the windpipe and then sucked back up. Cells will be picked up in the fluid and analyzed. Video assisted thoracoscopic surgery (VATS) or mediastinoscopy with biopsy: In this technique, a camera is inserted through a small incision near the area of concern (either a lung or lymph nodes in central chest area). This technique also requires the patient be put to sleep with general anesthesia in an operating room. If less invasive techniques do not find the diagnosis but the suspicion for cancer is high, the doctor might recommend this technique. As in an open surgical biopsy, if there is only a single area of concern, this technique (particularly VATS) can remove the entire lesion, thereby finding a diagnosis and removing the metastasis at the same time. Open surgical biopsy (thoracotomy): Putting the patient to sleep with general anesthesia and opening the chest to remove the part of the lung with the suspicious lesion is the best approach for reaching a definitive diagnosis. However, it is the most difficult way to biopsy a suspicious lesion. In reality, this method is reserved for a single isolated lesion in the lung that is highly suspicious for cancer. Not only can it find a diagnosis, but if it is the only lesion, it can also remove the metastasis at the same time. Transabdominal (or percutaneous): This method uses a small needle placed through the skin (after it is cleaned and numbed). In situations where the doctor is looking to get cells from a specific part of the liver (as in liver metastases), an ultrasound or low-dose CT scan will usually be used to confirm that the needle enters the suspicious area before removing the cells. The patient must lie still on the side of his or her body with the right arm up toward the head. The patient must hold his or her breath while the biopsy is being done. Transvenous: In this method, a specialist inserts a tiny catheter into the jugular vein and, using fluoroscopy, threads it back through the system of veins into the liver. A small biopsy can then be taken through the catheter and the cells can be examined under a microscope. This is not typically used for cancer diagnosis because it is difficult to get into a specific lesion. Laparoscopically: This method requires general anesthesia and an operating room. The patient will be put to sleep, and a small camera will be placed through the abdomen, along with a few other ports to help with the procedure. Once the liver and the suspicious growth are in view, a piece of tissue can be removed and sent for analysis. Percutaneous needle biopsy: In this method, a tiny needle is placed through the skin (after cleaning and numbing it) and placed into the bone. This is usually done with the guidance of a CT scan or fluoroscopy to make sure the needle gets into the right place. Cells are then drawn out and analyzed under a microscope. Open biopsy: In this method, the patient will receive some type of anesthesia that will either numb an entire area (regional anesthesia) or put the patient completely to sleep (general anesthesia). A small incision is made through the skin, the bone lesion is identified and cells are removed for analysis.